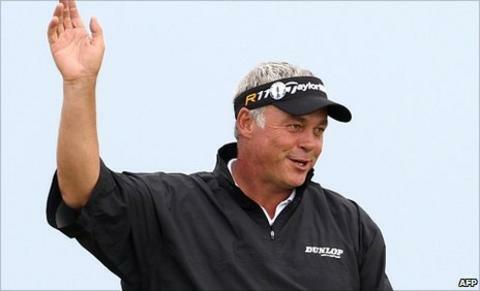 Northern Ireland's Darren Clarke will take a one-shot lead into the final round of the Open at Royal St George's on Sunday. The 42-year-old escaped some brutal morning weather and fired a one-under 69 to edge to five under on a day of attrition on the Kent coast. American Dustin Johnson climbed into second after sharing the joint best round of the day, a 68, with countryman Rickie Fowler. The 22-year-old Fowler's impressive score, despite enduring some of the worst of the driving rain and 35mph winds, took him up to a tie for third with first-round co-leader Thomas Bjorn (71) of Denmark. Spain's Miguel Angel Jimenez slipped to a two-over 72 to end one under alongside joint overnight leader Lucas Glover (73) of America. World number six Phil Mickelson headlined a group at level par comprising fellow American Anthony Kim (70), US Ryder Cup captain Davis Love (72), Germany's world number three Martin Kaymer, Dane Anders Hansen (72) and South African George Coetzee (72). US Open champion Rory McIlroy struggled to a round of 74, which included a double-bogey seven after going out of bounds at the 14th, to end on four over. Just three players negotiated Royal St George's under par on Saturday and only six are under par for the tournament going into the final round. Eight years ago when the Open was last played at Sandwich, only winner Ben Curtis finished under par. The record comeback in the last round of the Open was Paul Lawrie's 10-shot reverse courtesy of Jean van de Velde's meltdown at Carnoustie in 1999. Going into Sunday, 36 players are still within 10 shots of the lead. Clarke, who was second at Royal Troon in 1997 and third at Royal Lytham in 2001, went off in the last group at 1505 BST as the driving rain and 35mph gusting wind was abating. But despite a birdie at the first he was unable to stretch further clear and swapped two more birdies with two bogeys in evening sunshine. "I've a pretty decent chance. A major is always tough to win, but I've put myself in position," Clarke said. "From tee to green I can't really play any better. I had one of those days where I had full control of my ball flight, but I didn't have the speed with my putting at all. "If somebody had said before the start I could have 69, though, I would have bitten their hand off." As for the ovations he received he laughed and replied: "I think most of the crowd identify with a guy who's not quite an athlete and likes a pint." The powerful Johnson, 27, slipped back to one under after a bogey at the fourth, playing the hardest hole on the course because of the wind direction, but edged forward with a mix of six birdies and three bogeys. Johnson, who tied for 14th at last year's Open, took a three-shot lead into the final round of the 2010 US Open before collapsing to a closing 82 at Pebble Beach. "Obviously I've been in this situation a few times, so I think the more and more you can put yourself in it the more comfortable you get," he said. "I know what to expect. I know how to approach it and what to do." Fowler, playing with McIlroy for the third straight day, traded a bogey and birdie on the front nine and dropped another shot on the 10th but picked up three shots in his last six holes. "I had quite a bit of fun out there today," said Fowler. "Obviously it wasn't the best conditions possible, but I knew going into the day that it was going to play tough and just had to make the most of it. I would have loved a couple over par going into the day, but we made the best of the conditions and played well." McIlroy, 22, began the day at level par and was pleased to get through 13 holes in two over after bogeys at the first, third and eighth and a birdie at the long seventh. Five more pars followed as he battled the worst of the wind and rain but on the 14th at the far edge of the course his tee shot flew out of bounds on the right and his seven knocked the wind out of his sails. "It's a big setback," McIlroy said. "I obviously wanted to go out and get myself closer to the lead and not further away from it. "I wasn't able to do that and I'll need a good one tomorrow, and if it doesn't look like I can win, I'll try my best to get a top 10 or top five." Simon Dyson is the highest-placed Englishman at two over after a 72, while five-time champion Tom Watson also carded 72 to end four over, a shot better than 20-year-old English amateur Tom Lewis, his partner for the first two days. Lewis, playing with Mickelson on Saturday, took 76 but heads American Peter Uihlein (75) by two shots in the competition for the Silver Medal for leading amateur. Defending champion Louis Oosthuizen took 74 for six over, while Masters winner Charl Schwartzel had a 75 for three over and Australian Jason Day, second at the last two majors, amassed 76 for seven over.